Paul and Anne Cure worked together on farms during college, traveling the country together. On a small farm in Seattle, they realized the farm-to-table movement was beginning to get traction and decided they wanted to start their own farm and join this movement. They moved to Boulder and started Cure Organic Farm in 2005: the same year Hugo Matheson and Kimball Musk–from The River Café in London—and Bobby Stuckey and Lachlan Mackinnon-Patterson from The French Laundry in San Francisco—each moved here to open The Kitchen Café and Frasca Food and Wine, respectively. The restauranteurs and farmers shared the same vision of sourcing organic food from small, local farms; and friendships were born became the foundation for professional relationships that thrive to this day. Boulder was a unique landing pad for the right personalities at the right time: not only these entrepreneurs, but also the ecosystem of consumers to champion and support it. The fact each year, Cure alone receives 100 applications for interns to learn and study farming in Boulder, signifies how Boulder’s especial farming character. Within the farm-to-table movement, Paul notes the reciprocity and distinction between restaurants and farms. For restaurants: farm-to-table serves an economy of scale; for farms, restaurants are a part of the economic equation, but the economic base are CSAs and farmers’ markets. Restaurants elevate food and are type of theatre: restaurants are where food is a special occasion. For farms, food is blue-collar work, not theatre: food is about people getting their groceries. We can eat without a restaurant; we cannot eat without a farm. It’s a mutually beneficial relationship with complementary parts. Cured Organic Farm has been in business since 2005 and started selling at the Boulder County Farmers Market the same year. Of Cure’s 30 acres, 22 are leased from the City and County of Boulder. For Paul and Anne, the City and County of Boulder are a key ingredient in Boulder’s hospitable environment for small farmers. Cure is an organic, biodynamic farm that grows soil for the next generation. The Cures maintain the ecosystem, and keep the land in production so that future farmers will be given same quality of soil that they were given. In addition to vegetables, Cure raises ducks and chickens for eggs and three different breeds of hogs as “cheap tractors.” They rotate their ~40 hogs that till up last year’s crops and compost them throughout the farm. They also butcher some hogs to sell pork to restaurants and the farmers’ market. Education was a significant aspect of Paul and Anne’s starting their farm. They wanted to open the door for people curious about agriculture who might not have easily access to learn about it. Cure gives tours to students, from elementary to universities; participates with Senior Living; offers a kids’ summer camp for ages 6-9; and on-hand exposure of the ecosystem to employers like Google who want to get their employees off the screen for a bit. 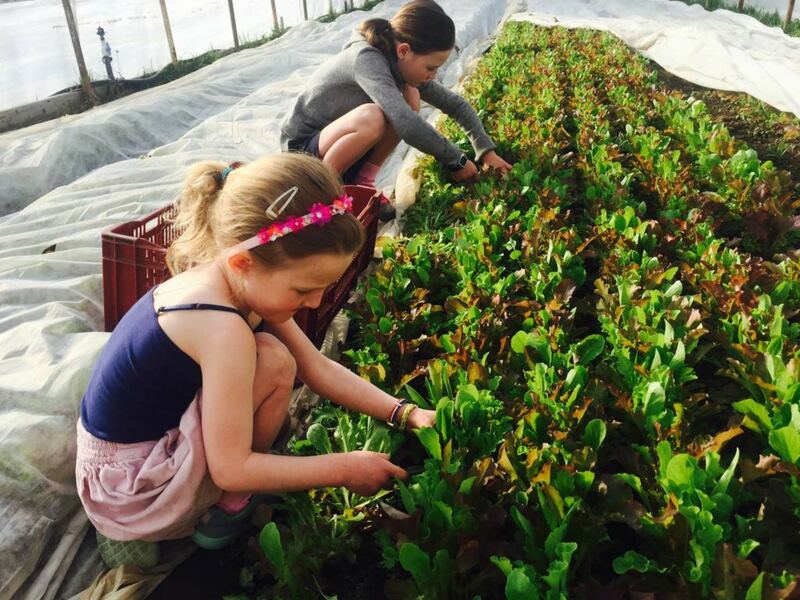 Cure hosts a volunteer every Thursday 9-12, from May to October, open to anyone in the community who wants to feel empowered and know where their food comes from. Cure delivers weekly in Boulder to Cured Boulder, Pizzeria Locale and Frasca, The Kitchen, Arcana, The Flagstaff House, Seeds at the BPL, and Black Belly Bistro. They also deliver twice weekly in Denver to Acorn, Beast and Bottle, Protégé, The Kitchen, Duo, and Western Daughters. “What’s growing now”! In March, Cure is loving pea shoots. The challenges are the seasonal variables of farming that change yearly according to weather—whether it’s a hot and dry year or a flood year. The joys are farming in Boulder’s unique farming eco-system of farming, from the enthusiastic farm-to-table community to legacy farmers who’ve maintained and cultivated land for generations, and the City and County of Boulder who lease to local farmers. Spring: Over-winter carrots and spinach (several varieties of each!). Summer: Tomatoes. Fall: Kale and collard greens and the like. Anne and Paul are the beneficiaries of others, notably Gene and Pat Sawhill, the Hogan and Ellis Families—lifetime farmers who first leased land to the Cures at an affordable price and, along with their neighbors the Munsons, encouraged them, and maintained tolerance of their mistakes and learning curve. This encouragement helped the Cures carve out a life here.